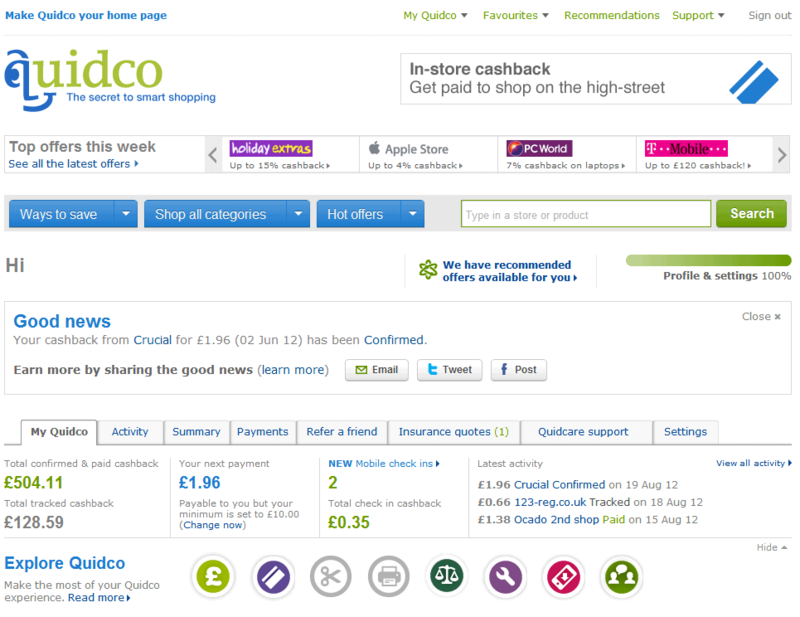 In brief Quidco.com offer a fantastic service which, if you remember to use it, can really help stack up the cash. The very modest fee of £5 is taken in a way which ensure you only pay if you are getting cashback, there is really no reason not to use this fantastic website. I’ve used Quidco.com for many years now. Skeptical at first as to how it worked I’ve now had hundreds of pounds paid to me in cash back just for buying the products and services I was going to buy anyway, but doing so via this site. So how does it work? There are a lot of big brand names on the site and it’s well worth a visit if you are moving and looking to get a new Sky/Virgin connection as well as home insurance, gas, electricity etc. The customer service is excellent and friendly, quickly responding to any questions you might have and aiming to resolve any issues as soon as possible. The only niggle is to do with Amazon, they’re listed on the site but don’t offer any offers. Visit Quidco and earn cashback.